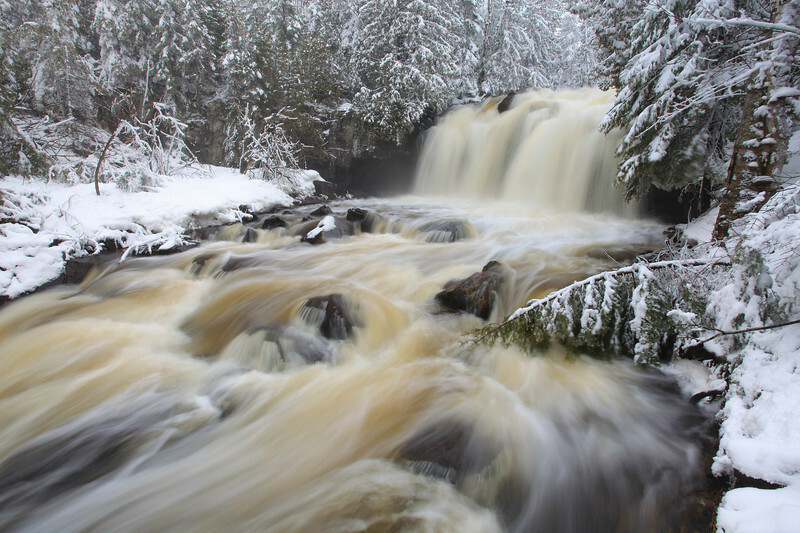 High Falls at Grand Portage State Park as the river starts to open up in early April of 2011. This photo was taken yesterday afternoon, just before we had a big thunderstorm that dropped some heavy rain on the area. I'm going to walk back up to the falls this afternoon to see what kind of a difference yesterday's rain made on the ice and the water flow. High Falls at Grand Portage State Park, MN. There is a lot of snow in the woods this spring, and thanks to a recent week of warm temperatures combined with a nice rain storm the Pigeon River opened up nicely a few days ago. However, winter is not quite ready to let go and last night cold temperatures returned to Grand Portage. 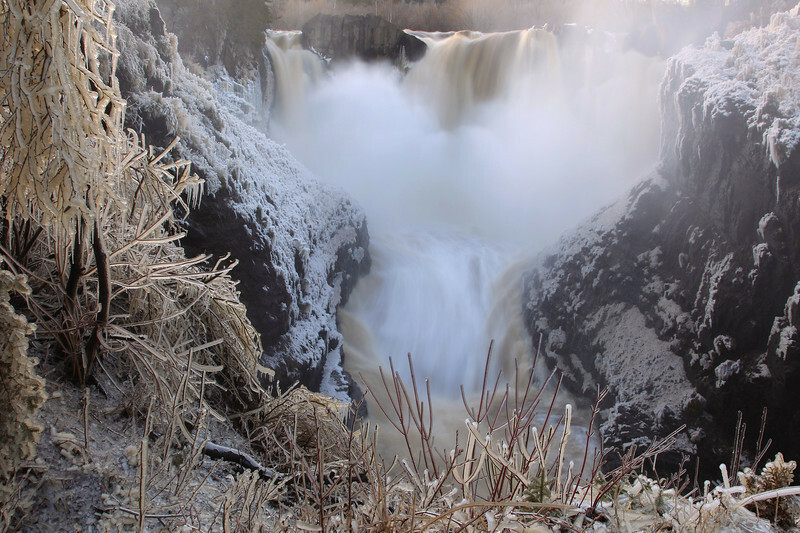 The cold air meant that all the mist at High Falls was freezing to the trees, shrubs and grasses throughout the night and all day today, making for an amazing icy scene. 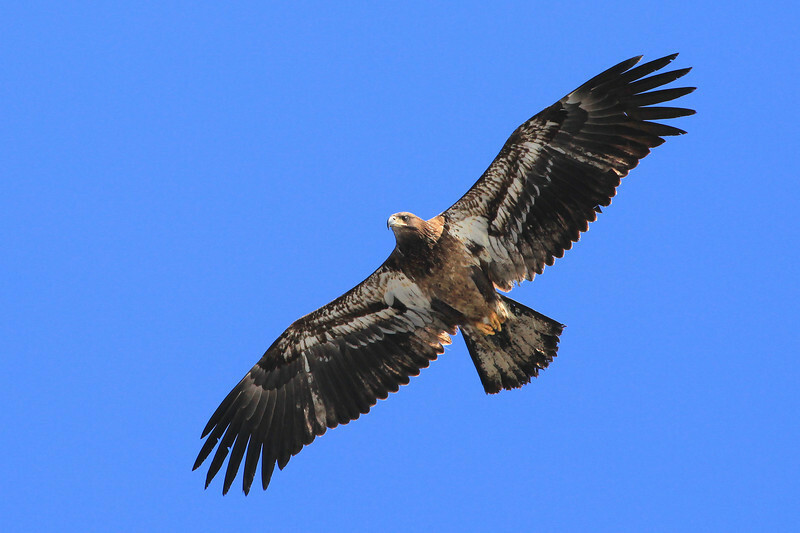 Just one of the 4 Eagles that I saw flying around the visitor center at work today. 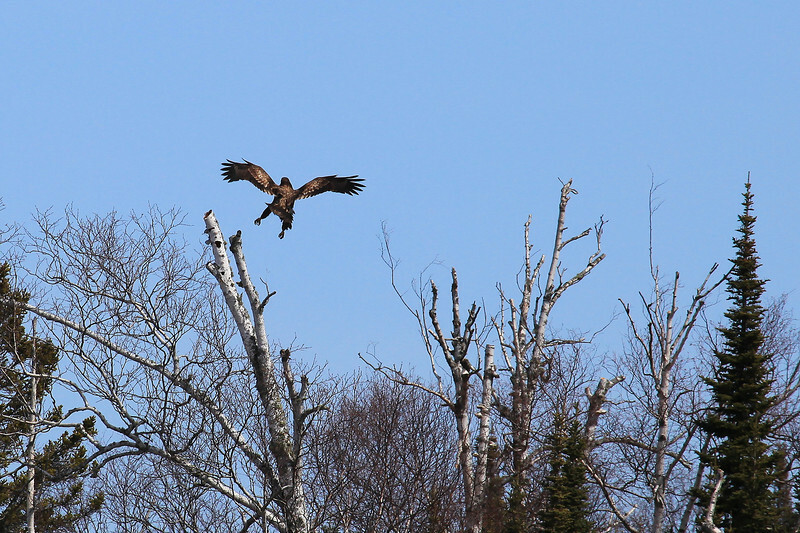 This immature Eagle was coming in for a landing on one of the Birch trees along the banks of the Pigeon River. 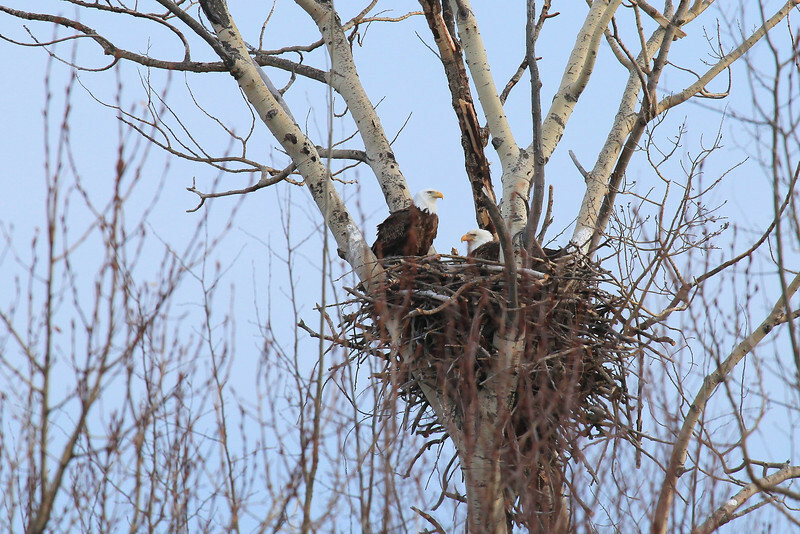 A pair of Eagles watches over their nest as they take turns incubating the eggs. Butterwort Cliffs Scientific Natural Area - Near Cascade River State Park, MN. Temperance River State Park near Tofte, MN. I made this image a couple of nights ago after a "spur of the moment" decision to drive down to Temperance and photograph the sunset. It was cloudy in Grand Portage, but I figured what the heck I'd give it a shot. It's a good thing I did, as there was a beautiful sunset that evening! 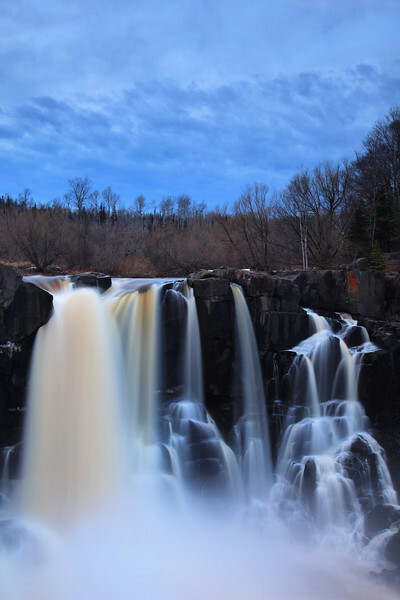 "Spring Evening at High Falls"
Grand Portage State Park, MN. 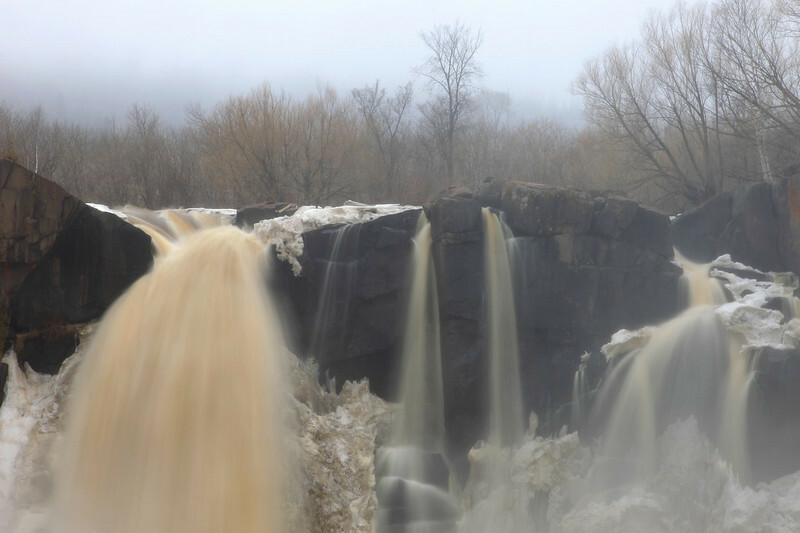 The water level at High Falls right now is perfect for doing long exposures and capturing many layers of water. 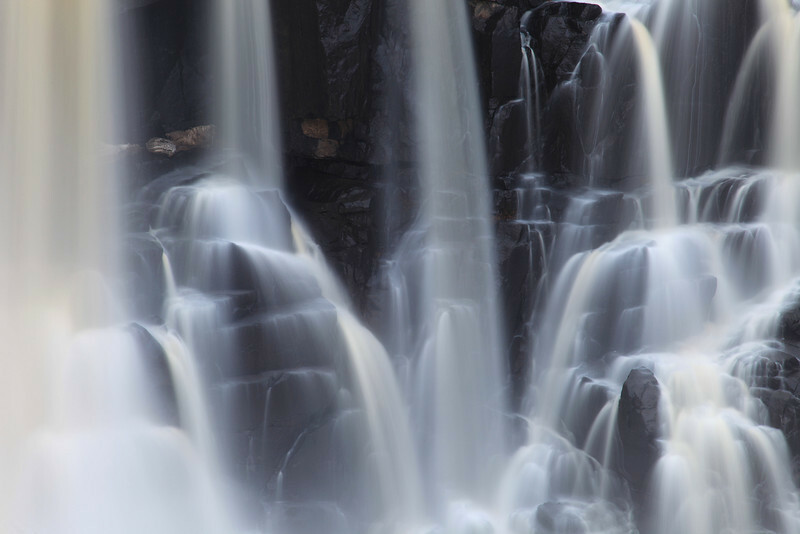 Get there and visit the falls now while the water conditions are optimum for this kind of shot! "High Falls Detail, Pigeon River"
This photo was taken a few days ago at Grand Portage State Park in Northeast Minnesota. After the ice broke up on the river this year, the water level was initially at a level of 3.5 feet. A few days after the ice-out, the river level was at 8 feet. Since then, the river level dropped a bit to just over 5 feet, but it is now on the rise again. With more moisture in the forecast for the next day or two, it may reach 8 feet again (or more!). This weekend is shaping up to be another great one to view the falls... come out and see it while the water is high! "Spring Snow on Portage Brook"
This year, spring in Northern Minnesota has been slow to arrive. This photo, captured the day after a late winter storm dropped 5 inches of snow on the Arrowhead Trail in Cook County, is proof of that fact. Most people that I've talked to recently have had more than their fill of winter. 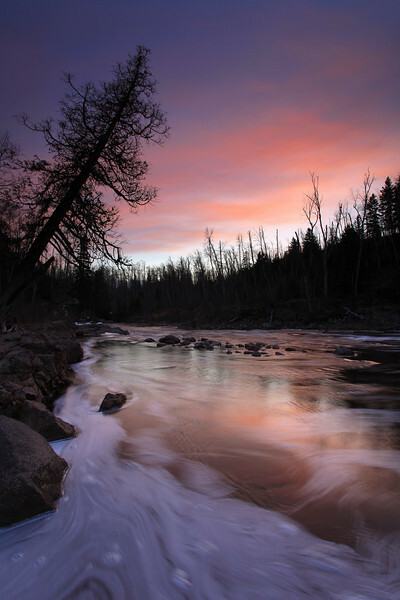 I, on the other had, welcome a late winter/early spring snow storm, especially after the rivers have opened up. 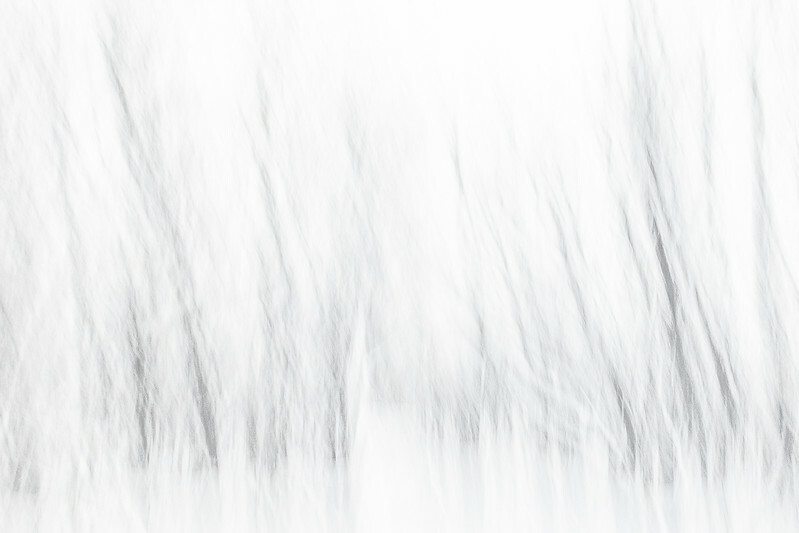 The contrast of fresh snow and running water makes for some incredible imagery. This waterfall is a little-known gem not far from the Canadian border. The trail to this falls is not marked, and is a short but rugged hike. Just before you get to the falls, there is an area where blowing snow collects and drifts rather badly. I had to wallow my way through a drift that was almost waist-deep in order to get to this vantage point on the falls. By the time I got back to my vehicle, my pants and shoes were soaked from pushing my way through the wet snow. As is often the case, however, the photos that I got were worth the effort. This image was made using my Canon EF 17-40mm lens, shutter speed was 1/2 second, aperture f22, ISO 50.